Britain is in turmoil. Hitler’s troops advance deeper into Europe and the world is at war. 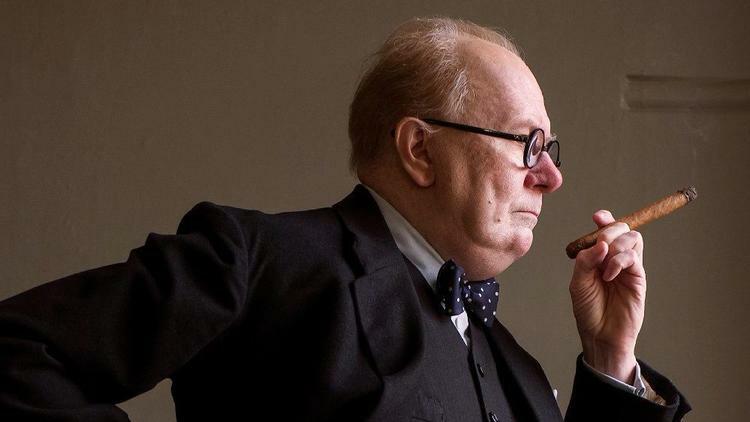 Joe Wright’s Darkest Hour focuses on this momentous turning point in Winston Churchill’s life as the newly appointed Prime Minister in May of 1940. As Churchill takes on the mantel of leadership, we follow the track of the challenges he faced and the daunting decision which would shape history. Does he compromise or does he fight? I caught up with director Joe Wright to break down the all important opening to Darkest Hour as we turn from a bickering Parliament to the man who had been handed the task of Prime Minister. We did six months of trial and error and experimentation. The first time we tried it, it looked like he had a raw chicken on his face and then we went too far the other way and eventually after much trial and error, we found, I hope the sweet spot where he looked like Churchill, but having enough accessibility to Gary’s performance. One of the interesting things about this movie is that the villain of the piece is absent, we never get to see him, and that villain being Hitler. In the very opening images, I wanted to convey that presence so we immediately state what we’re up against. Then we cut to an overhead shot of The House of Commons and the title comes up and the House of Commons is in complete disarray. I came up with the motif of these high angle, God’s eye views when thinking about the later themes. I always remember from the Clash Of The Titans where the Gods are playing with the mortals on a chessboard. It made a huge impression on me as a child and I was reminded of it when thinking about Churchill looking over the maps and moving human lives around and that power, control, and responsibility. I developed the idea of these high-angle shots and wanted to comment on the role of the audience and the filmmaker in that high-angle shot in the opening frame. So the role of the God’s eye changes throughout the film and finally the last shot is a shot of Winston who is now the mortal as the camera rises up. I started with that God’s eye view and the camera drops and pulls back to reveal a frame that clearly illustrates the divisive nature of the situation, the absolute chaos. You have the Labour party on one side and the Conservatives on the other and they are at war within themselves. We push in and the ear starts to focus on the dialogue and now we hear what Clement Attlee is saying. We begin to focus on the main point of that speech and the only point that the audience needs to understand is that Chamberlain must go and Attlee points his finger and that motivates the camera to move and finally rest in a close up on the problem, and that problem being weak leadership under Neville Chamberlain. We pull back from Chamberlian and move across to find another frontbencher and the frontbencher turns to Eden and wonders where Churchill is who replies, “Making sure his fingerprints aren’t on the murder weapon.” We tilt down to reveal Churchill’s hat. I really liked the idea that the first time we see Churchill is his hat. He played many different roles in his life and we all play different roles within our lives and this is the moment he’s required to play this role. After the hat, we cut to the Conservative party dinner and this scene is a little exposition talking about Chamberlain’s resignation and who could possibly follow him and there’s a definite inclination among the conservative party that it should be Halifax and we build on that antagonism. He’s unwilling and we discover the only person the Labour party will support is Churchill. We go to Churchill’s house and the idea was to hold back on revealing Churchill for as long as possible to build the tension and suspense in the reveal of him. We have everyone talking about him without seeing him. I wanted to up the role of women in the film and I felt I needed to make sure they had a front and center role in this movie as much as possible given it’s very male-centric. Elizabeth Leighton is a normal person, a working class girl and I wanted to reveal Churchill through her eyes, so we follow her through until finally she enters the dark room and we reveal him very theatrically with the opening of the curtains, much like you’d open theater curtains to create a spotlight on him. He strikes a match and it’s really a little nod for me to Robbie Turner in Atonement because he died by the light of a single match in Atonement. I wanted Churchill to be revealed by a single match in this movie. This is a film about words and the power of words to shape and change history. His words will be his legacy. I wanted to hear his words before I ever saw him. He starts speaking in darkness, he lights the match and is lying in bed in this big pink thing and this is the man who’s supposedly going to save Western civilization. The movie is very much an interior film and I enjoy the opportunities that limitations afford. I enjoy that liberation. One of the limitations was the fact it was set in May 1940 and was the hottest May on record and yet we were shooting it in December and January. We couldn’t do lovely exterior shots in London. when we shot outdoors, we had to make sure we were surrounded by walls and I chose to set most of the film inside and use that to amplify the claustrophobia and growing tensions that he was under. I was worried we’d be lacking scale and the movie would feel too small. I fought hard to build a set of the House of Commons, it was expensive, but I wanted to get those wide shots. I fought hard to get it populated by people. We needed those 600 people in there to give it that sense of scale. A lot of work was put into creating that set and that environment and those people so they would support Atlee or indeed Churchill’s latest speeches.